Shama Ayyad was struck killed by an SUV driver on October 5, 2013 while crossing El Camino Real in this crosswalk in San Mateo. The crossing distance is over 100 feet here. Photo: Google Maps. Despite pockets of new development, El Camino Real remains a dangerous, car-oriented urban highway along most of the San Francisco Peninsula. If it can ever transform into a great street, it will have to become safer for walking and biking. And while enhancing walkability is a key goal of the Grand Boulevard Initiative — the long-term planning effort to improve El Camino Real between San Francisco and San Jose — redesigning a state road to prioritize safety is always a tough lift, since Caltrans design standards create a thick barrier of red tape. In response, San Mateo County planners are working on four demonstration projects to show how a redesigned boulevard will function. El Camino Real is the deadliest street in the San Francisco Bay Area for pedestrians, according to a review of traffic fatalities conducted by the Center for Investigative Reporting in April. Of the 59 people killed in traffic collisions on the street between 2002 and 2011, 37 — about two-thirds — were pedestrians. In comparison, only 22 percent of the 2,791 people killed in car crashes statewide in 2011 were pedestrians, according to Caltrans data. Car-oriented commercial retail centers currently dominate along El Camino Real, but residential and office development is gradually filling in the corridor. With more destinations clustered together, walking, bicycling, and transit become increasingly practical for residents and workers. “Improved walkability and transit are critical to allow El Camino to become the kind of environment that can accept growth without generating additional traffic,” said Egon Terplan, regional planning director for SPUR. But as a state highway, the street is built primarily to accommodate large volumes of automobile traffic, using the same design standards that apply to freeways. The street’s current design gives little thought to the safety of people walking, bicycling, or accessing transit. 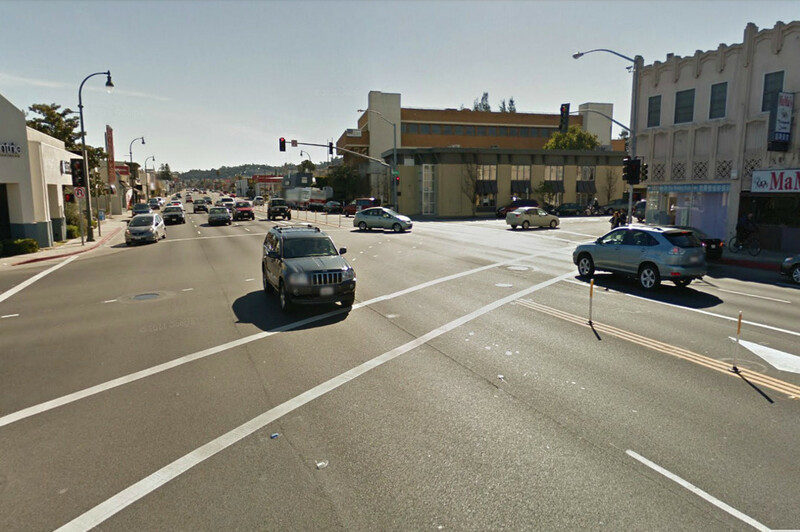 The most recent victim, 66-year-old San Mateo resident Shama Ayyad, was struck and killed by an SUV driver the morning of October 5 while walking across El Camino Real in a crosswalk at 25th Avenue in San Mateo. Police said they were investigating the timing of traffic signals to determine who had the right of way, and whether the driver’s speed played a role in Shama’s death. Because El Camino Real is a state highway, many design features known to improve safety, such as narrower travel lanes, tighter curb radii, and trees planted in the median near intersections, cannot be implemented because they don’t appear in the Caltrans Highway Design Manual. Gaining the necessary approvals from Caltrans adds cost and delay these projects, making funding more challenging to secure and reducing political support for such improvements. 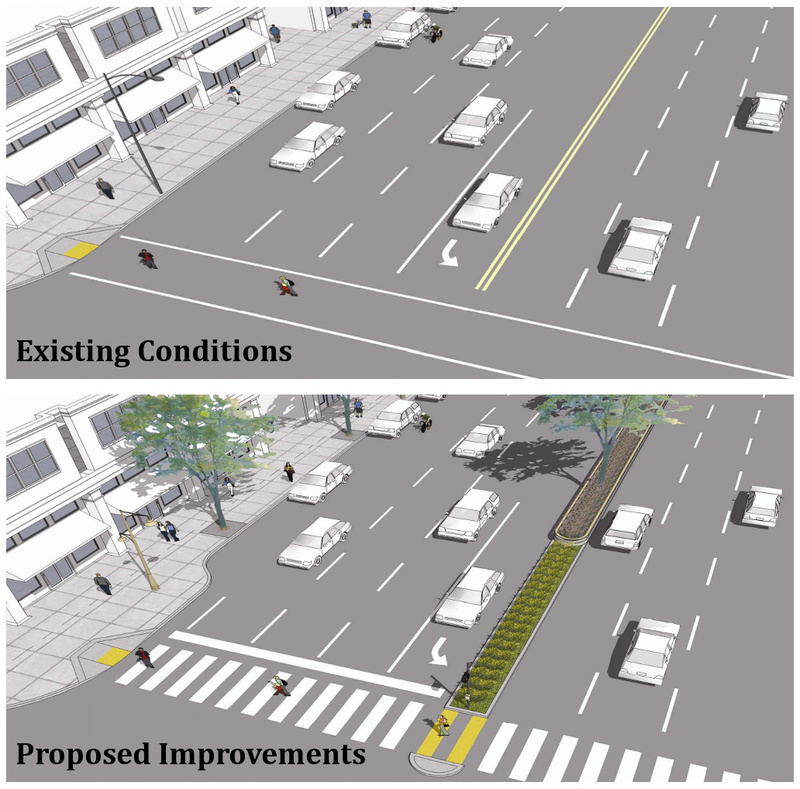 Planners in San Mateo County hope to overcome this barrier with the Grand Boulevard Initiative’s Complete Streets Project, which will re-design four short segments of El Camino in Daly City, South San Francisco, San Bruno, and San Carlos. The segments range in length from a half mile to one mile and will complete the Caltrans design exception process needed to actually construct them. For the San Carlos segment, a total of six design exceptions are required. The project, which isn’t funded yet, currently doesn’t have a timeline. 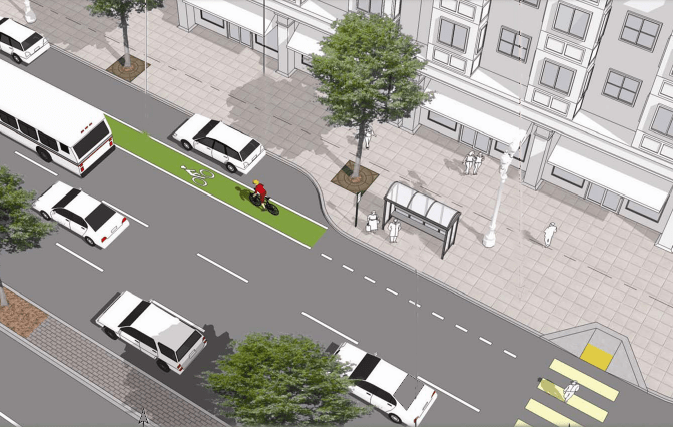 A typical intersection improvement will create space for pedestrian islands and bike lanes by narrowing travel lanes, and will include sidewalk curb extensions and bus bulbs. Street trees will also be planted in center medians and along widened sidewalks. One design change known to have a significant impact on safety is not being considered by the Complete Streets Project, however: a lane reduction, or road diet. “The most effective way to slow traffic is to have fewer lanes,” said Mayer. “If we really want a Complete Street, we have to make a commitment to making it safe for everyone.” El Camino Real is currently six lanes wide for most of its length, but already narrows to four lanes through downtown Burlingame, Redwood City, Atherton, and Menlo Park. The real question is why should Caltrans have control over El Camino Real in the first place? Caltrans has given up control of other monumental traffic sewers like Route 66 in the Inland Empire. Relinquishing control over El Camino Real is a no-brainer. Caltrans is willing to give up control. The Alameda in San Jose is an example. But with control comes the responsibility for maintaining it, which is not a small budget item. I don’t know how many cities would want to take on that kind of burden without getting funding. I did a big study on how easy it would be to walk from downtown Millbrae to the BART station which most people are not brave enough to do now. You can view it here: http://jfrankwalks.files.wordpress.com/2011/03/wayfinding_in_millbrae.pdf. Millbrae has the widest section of El Camino along the peninsula which makes it really tough to cross on foot. The great contradiction of the peninsula is that most of the towns along ECR have very cute and walkable downtowns but nowhere to walk outside of that. Creating links from these compact downtowns to transit stations is essential. 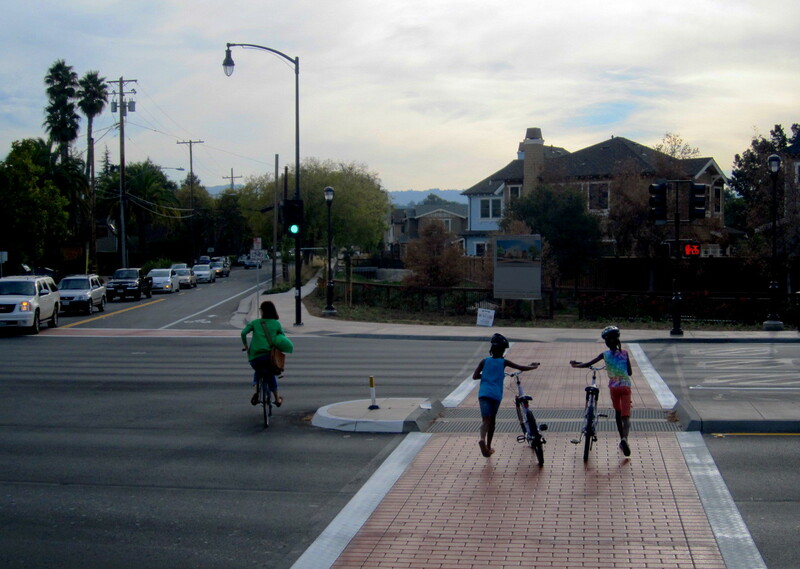 One simple way to get folks on foot is to created one safe and pleasant crossing near each Caltrain station and you’ll get folks to walk and ride there. Unprotected bike lanes are unacceptable on El Camino, traffic moves at 40mph!. The whole route is lined with massive parking lots – just eliminate curbside parking and build raised lanes. Jim, I hope to read your comprehensive look at the Millbrae intermodal station and I agree that it would be great for Millbrae businesses and BART and Caltrain patrons to have a pleasant, pedestrian (and bicycle friendly) connection between the station and downtown. Ideally, such a path would be along a street or plaza that is free of automobile traffic (or traffic calmed). There certainly appears to be ample space available to make this happen. It’s interesting that downtown Millbrae (like other Peninsula towns) does not charge for on- and off-street parking. Despite this, it is a reasonably pleasant place to walk and bike once one is away from El Camino Real. We have to keep bikes off of El Camino Real, and the best way to do that is to institutionalize car parking with cyclist pushouts, and focus on drive-, walk-, and bus-ability of the corridor. We should focus on making these things easier, but if we have the opportunity to make cycling more difficult at any time during this process, we should pounce — two birds with one stone. So I agree with Egon Terplan — the best plan to maintain automobility is to not even mention bike-ability, which will help to make sure the idea of allowing bikes on El Camino Real doesn’t infect our minds. We need to continue doing exactly what Jane Jacobs advised we not do as a society — and talk about taking things away, like road width — instead of adding things, like protected bike lanes (which would be a disaster, obviously). As for planting trees in the middle of the road — well, what human in their right mind could disagree with that? Because. Trees.